Below you will find a list of current studies with short summaries. Please consider being a part of a study. The research is a key to your cure! We will enroll individuals who are first-degree relatives (child, sibling, parent, or grandparent) of a patient with a diagnosis of one of the acute porphyrias (index case). We are interested in all three types of acute porphyria in which the index case has been confirmed by genetic testing: Acute Intermittent Porphyria (AIP), Hereditary Corproporphyria (HCP) or Variegate Porphyria (VP). Participants (the first-degree relatives) must not have had any genetic testing as yet. They will have an initial visit during which they will complete a history questionnaire and have routine laboratory tests, including genetic testing for porphyria. The researchers will use this data to develop a Clinical Profile of the risk factors associated with being a genetic carrier of acute porphyria. This is an interventional study (study in which investigators give research subjects a particular medicine (in this case isoniazid) to measure how the subjects' health changes while using the medicine). To participate, all participants must also be enrolled in the Longitudinal Study of the Porphyrias and be willing to share their medical records with researchers. In the initial visit, participants will have a general physical exam and blood drawn for lab work. Participants will also be prescribed a dose of 300 mg of Isoniazid that they will need to take daily. Participants will need to have a follow up visit every two weeks for twelve weeks. Each follow up visit will include a blood test to see how the Isoniazid is working. This study compares two treatments for PCT. The initial treatment phase may take up to 6 months. During this phase subjects are followed every 2 weeks. After the treatment phase subjects will be followed at least 3 years. Study patients will be characterized in terms of known risk factors for PCT, including drinking alcohol, smoking, hepatitis C, HIV infection, estrogen use, and genetic characteristics. Blood plasma and urine porphyrin concentrations will be measured at 2-week intervals for up to 6 months. After that participants will be followed every 2 months for the first year and every 6 months for the second year. There will be one final follow-up visit in the third year. This is a longitudinal study (study taking place over a long period of time) of about 150 individuals with EPP. Participants enrolled in this study should also be enrolled in the "Longitudinal Study of the Porphyrias" Those participating in this study will be evaluated yearly. Follow up visits can be conducted with the participant's local physicians. Please contact the APF for more information or to get enrolled in the studies 713.266.9617. 22 Things Happy People Do Differently. Are you a happy person despite Porphyria disease? Disclaimer: This article is not intended to address those with clinical depression or other mental illnesses. Please always seek the advice of your Doctors before starting or making any lifestyle changes. There are two types of people in the world: those who choose to be happy, and those who choose to be unhappy. Contrary to popular belief, happiness doesn’t come from fame, fortune, other people, or material possessions. Rather, it comes from within. The richest person in the world could be miserable while a person living in the slums of a third world country could be happy and content. I have spent plenty of time amongst both groups to have seen it first hand. Happy people are happy because they make themselves happy. They maintain a positive outlook on life and remain at peace with themselves. So what are you going to work on, please share your comments and views below. All of these avenues contribute to your health and wellbeing and play and major part in controlling your Porphyria and other health conditions so why not start today? TO SOME PEOPLE, sleep is a waste of time. Preferring a very busy daily schedule of business and social engagements, they only surrender to sleep when extremely tired. In contrast, others, enduring night after night of tossing and turning until the early hours of the morning, would give anything for a good night’s sleep. Why do some find it so hard to sleep, while others are desperate to stay awake? Should we view sleep as a luxury or a necessity? To answer these questions, we need to understand what is going on while we are asleep. Exactly what makes a person lose consciousness and fall asleep remains a mystery. Researchers, however, have established that sleep is a complex process regulated by the brain and that it obeys a 24-hour biological clock. As we get older, our sleeping habits change. A newborn sleeps for frequent short periods that total about 18 hours a day. According to sleep specialists, although some adults appear to need only three hours of sleep a day, others need up to ten hours. Recent research has shown that variations in our biological clock also explain why some teenagers struggle to get out of bed in the morning. The biological clock seems to shift forward during puberty, making youngsters want to go to sleep later and wake up later. This sleep delay is common and tends to disappear in the mid-to-late teens. Our biological clock is regulated by chemical substances, many of which have already been identified. One of them is melatonin, a hormone thought to trigger sleepiness. Melatonin is produced in the brain, and some scientists believe that it is responsible for the slowdown of the body’s metabolism that occurs prior to falling asleep. As melatonin is released, body temperature and blood flow to the brain are reduced, and our muscles gradually lose their tone and become flaccid. What happens next as the person descends into the mysterious world of sleep? Approximately two hours after we fall asleep, our eyes begin to quiver quickly back and forth. The observation of this phenomenon led scientists to divide sleep into two basic phases: REM (rapid eye movement) sleep and non-REM sleep. Non-REM sleep can be subdivided into four stages of progressively deeper sleep. During a healthy night’s sleep, REM sleep occurs several times, alternating with non-REM sleep. Most dreaming occurs during REM sleep. The body also experiences maximum muscle relaxation, which allows the sleeper to wake up feeling physically refreshed. In addition, some researchers believe that newly acquired information is consolidated as part of our long-term memory during this sleep stage. ... circulatory system and helping to ward off cardiovascular disease. In addition, the production of growth hormone peaks during non-REM sleep, with some teenagers producing as much as 50 times more growth hormone at night than during the day. Sleep also seems to affect our appetite. Scientists have discovered that sleep really is, to quote Shakespeare, “chief nourisher in life’s feast.” Our brain interprets a lack of sleep as a lack of food. While we sleep, our organism secretes leptin, the hormone that normally lets our body know that we have eaten enough. When we stay awake longer than we should, our body produces less leptin, and we feel a craving for more carbohydrates. So sleep deprivation can lead to increased carbohydrate consumption, which in turn can lead to obesity.—See the box “An Afternoon Nap,” on page 6. But that is not all. Sleep makes it easier for our body to metabolize free radicals—molecules that are said to affect the aging of cells and even cause cancer. In a recent study carried out by the University of Chicago, 11 healthy young men were allowed only four hours of sleep a day for six days. At the end of this period, their body cells were performing like those of 60-year-olds, and their blood insulin level was comparable with that of a diabetes sufferer! Sleep deprivation even affects the production of white blood cells and the hormone cortisol, making a person more prone to infections and circulatory diseases. Without a doubt, sleep is vital for a healthy body and mind. In the opinion of researcher William Dement, founder of the first sleep study center, at Stanford University, U.S.A., “sleep seems to be the most important indicator of how long you’ll live.” Deborah Suchecki, researcher at a sleep study center in São Paulo, Brazil, comments: “If people knew what is going on in a sleep-deprived body, they would think twice about concluding that sleep is a waste of time or just for the lazy.”—See the box above. But is all sleep restorative? Why do some people sleep the whole night and still feel unrefreshed? The next article will help you identify some of the principal sleep disorders and will explain how you can get quality sleep. Have you ever felt an uncontrollable drowsiness after lunch? This is not necessarily a sign that you are suffering from sleep deprivation. It is normal to feel sleepy in the early afternoon because of a natural drop in body temperature. In addition, scientists have recently discovered a protein called hypocretin, or orexin, that is produced in the brain and helps keep us awake. What is the connection between hypocretin and food? When we eat, the body produces leptin to give us the impression that we are full. But leptin inhibits the production of hypocretin. In other words, the more leptin there is in the brain, the less hypocretin and the greater the feeling of drowsiness. Perhaps that is why in some countries people take a siesta—a break in the workday that allows people to sleep a little after lunch. Below you will find a list of current studies with short summaries. Our next E-news will cover the second portion of the ongoing studies. Participating in annual visits or contacts. Providing samples, including blood, buccal cells (cells from inside of the mouth), saliva, urine and a skin biopsy. The type of samples and amounts may vary from person to person, depending on the type of porphria. Giving permission for samples to be stored and used for porphyrias research. Granting permission to obtain your medical records. Interview to provide information about your medical history and family history. Completing a questionnaire about your porphyria. To evaluate the safety of glucose and Panhematin, compared to glucose alone for acute attacks of porphyria. To be eligible for the research you will have to have frequent and predictable attacks. This study is conducting research for the Erythropoietic Protoporphyria (EPP). This study will identify the characteristics of erythropoietic protoporphyria (EPP) in the blood. People with EPP have skin sensitivity to sunlight and occasionally develop liver disease. In this study, we hope to learn the nature of the characteristics of EPP in the blood because this may help explain the seriousness of the clinical features. When It Comes to Your Health, Speak Up! a lot. You likely have regular checkups to keep track of your health. the way you are feeling. feel comfortable talking freely with him or her about your condition. doctor may be brief. But it can—and should—still be meaningful. You may have questions. You deserve answers. You also need to be able to express what you’re feeling or thinking about your condition. It is something you are living with every day. to. And the more information you have about your condition, the better prepared you will be to manage it properly. So please take a few minutes to turn to porphyriafoundation.com to learn about each type of Porphyria, What it is, symptoms, diet and lifestyle, testing, medications and daily living. I encourage you to print copies, write your questions ahead of time, be in charge of the Doctor visit! When a Dutch orphan, Ariaantje Adriaanse, set sail for South Africa in 1688, chances are she offered more than her hand in marriage. Now, more than 300 years and thousands of descendants later, scientists have uncovered her likely genetic legacy — a disease that has spread exponentially throughout the South African population. Scientists Peter Meissner at the University of Cape Town and Harry Dailey at the University of Georgia have identified the gene mutation that causes variegate porphryia. Ariaantje Adriaanse, the Dutch orphan who likely carried the porphyria gene to South Africa, journeyed for four months from the Netherlands to Table Bay aboard the China — a ship similar to the one depicted here from the same period. In this painting, the Griffioen, a type of ship called an eastindiaman, docks at the foot of Table Mountain, off Cape of Good Hope. Pen painting by Cornelius Pietersz. de Mooij (?-1676). In the 1950s a British doctor noticed South Africa’s high incidence of a disease called variegate porphyria (poor-FEAR-ee-ah). Using family Bibles to trace lineages, he discovered its genetic nature. Since then scientists have found that variegate porphyria is the second most common inherited disease in South Africa. Several kinds of porphyria have been found in humans, each with its own telltale combination of symptoms. For example, patients with variegate porphyria experience light sensitivity, easily broken skin, and occasional and unpredictable acute attacks involving intense abdominal pain. Various medications, chemicals and even sunlight can trigger these attacks. Scientists like Peter Meissner at the University of Cape Town (UCT) study the disease and its symptoms to better understand how it affects the South African population. Researchers have learned that heme, the iron-rich molecule that transfers oxygen from the blood to cells, plays a key role in the disease. Half a world away, Harry Dailey, a UGA professor of microbiology, biochemistry, and molecular biology and director of UGA’s new Biomedical and Health Sciences Institute, is studying the body’s assembly line-like production of heme. Dailey drew the South Africans’ attention with his research on PPO — which stands for protoporphyrinogen oxidase — one of the enzymes required to make heme. A defect in PPO is the key element in the onset of porphyria. Producing heme requires eight different enzymes. When any one of these enzymes malfunctions, heme precursors, called porphyrins, build up in the blood. This increase in porphyrins results in porphyria. The human body makes the heme molecules it needs like an assembly line — enzymes add each piece sequentially to create the finished product. “So anything that affects one part of the assembly line will have an impact on the other part of the assembly line,” Dailey said. Science has yet to understand how the overproduction of porphyrins causes the skin sensitivity and abdominal pains. “The actual symptoms are, as far as one can tell, really not directly related to the compound heme itself,” Dailey said. Porphyria is divided into seven types, depending on which enzyme is malfunctioning. For example, PPO functions at the sixth step in the heme assembly line. Defective PPO results in variegate porphyria, the type most common in South Africa. Dailey’s lab was the first to purify the PPO enzyme. For this reason, Meissner arranged to do post-doctoral studies in his lab, creating the foundation for a future partnership. Then UCT invited Dailey to South Africa to share laboratory techniques. Two years later, Meissner, now director of the internationally recognized Porphyria Research Unit at UCT and the leading researcher on porphyria in South Africa, again settled temporarily at the University of Georgia to work on another project — identifying the mutation responsible for variegate porphyria. Together, Meissner and Dailey first found the normal PPO gene, or the chain of molecules within DNA that acts as a code to make PPO. They then sequenced the gene, or determined the order of the molecules in the gene, using the enzyme Dailey’s lab had already copied. To determine the mutation — or change in the DNA sequence — they compared the normal PPO sequence to that of a person with the disease. The researchers specifically compared the function of the normal and mutant PPO enzymes and found that the mutant PPO results in variegate porphyria. In order to even begin this process, the researchers needed cells containing the mutation. Because variegate porphyria is a dominant inherited trait, an individual only needs one copy of the mutant gene to develop the disease. University of Texas Medical Branch in Galveston, TX is recruiting patients with acute porphyria attacks. During the trial, both glucose and hemin given by an infusion through the veins and are considered standard treatments for attacks of porphyria. Hemin has been on the market since 1983, and based on experience over the past 30+ years is believed to be the most effective treatment. But a good study to prove that it is effective has not been done, and this has impaired its acceptance by doctors and its availability to patients. This study is designed to provide the needed evidence that has not been available before. To evaluate the safety of glucose and Panhematin, compared to glucose alone for acute attacks of porphyria. This is a clinical trial, which means its purpose is to study an intervention or treatment. It is also a randomized, controlled clinical trial, which means there is a treatment group given active drug and a control group given an inactive placebo. In this study, both groups are also treated with glucose, which is what the Food and Drug Administration (FDA) currently recommends before treatment with Panhematin. The study will occur in the hospital, with planned follow up visits in the outpatient clinic or by telephone. Be in an acute attack of porphyria. Contact the Amy Chapman~ Amy.APF@gmail.com orAPF for enrollment and more details 713.266.9617. Happy Friday everyone! 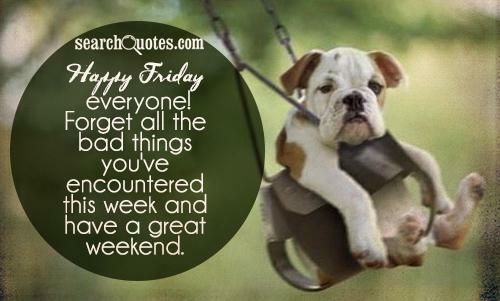 Forget all the bad things you've encountered this week and have a great weekend. Over 200 participants will join in-person, and over 5,000 via Livestream webcast during the Global Gene’s 2014 RARE Patient Advocacy Summit, September 11-12, at the Hyatt Regency Resort & Spa in beautiful Huntington Beach, CA. One of the most exciting things about being a patient advocate is having the opportunity to see behind the scenes in science. All over the world, small labs with big ideas are breaking down barriers between patients and treatments. You’ll have a front row seat to the presentations of four ground-breaking research platforms that are about to change the way we create solutions for rare disease on a global level. These twenty-minute science briefs promise to show new approaches to research and drug development. In each segment, there will be five minutes of Q&A that will allow rare disease non-profits and patient advocates a chance to ask questions, learn more about each project and how its mission will help bring drugs to market more quickly for those in the fight against rare disease. Hear fromProject Violet, Immusoft Corporation, American MedChem andRARE Science. More information here. Advocates at this year’s 2014 Global Genes Patient Advocacy Summit will have an exclusive chance to learn how their voice can make a difference in the fight for faster cures. For critical patients and their families, the risk versus benefit of new treatments has been a simple decision. Learn from FasterCures’ Director of Strategic Initiatives, Kim McCleary, about what these programs mean for rare disease advocates. You’ll hear how patient organizations are mobilizing their communities to help inform decisions made by the FDA and industry sponsors so that treatments move more swiftly from the lab to the patients who need them. More information here. At this year’s RARE Patient Advocacy Summit you’ll take your first steps towards being unstoppable as Zenzaga CEO, Keegan Johnson, brings you the answers and the attitude it takes to create an unstoppable charity. What can advocates hope to learn at this session? Show Me The Funds: How and where do I get more donors? What makes or breaks a fundraiser? How can I put our organization on a plan for financial growth and opportunity? Get Them Engaged: How can I get people excited about our mission? How can I bring on new volunteers and inspire them? How am I going to get our supporters involved? Can They Hear Me Now? : How can I effectively tell our story to help our project grow? How do I generate momentum– Increase member engagement and learn the same strategies politicians and network-marketing experts use to make their visions reality? Can’t attend in person? Our new Livestream webcastcomponent will allow up to 5,000 advocates from around the globe to attend virtually from their homes or offices via webcast at no cost! The event will be broadcast live with opportunities for patients to participate from afar using social media such as twitter and Facebook, using the hashtag #2014GGSummit. I thought this was something to share with you. Life and daily living can be hard so what do we need? Enjoying The Day My Way! even though I know the rays of the Sun are on their way. and so this is my time to feel alive! I can't live in the Sun like you! My skin is never exposed. Yes I have to wear a lot of clothes. Yes I receive strange looks and glares. To enjoy life is my only care! I could be sad, or even mad. To love life is a better way. Because I live life my Way!